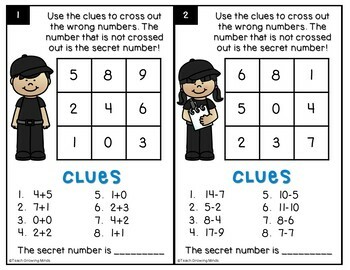 Students will use the clues on each card to cross out the wrong numbers. The number that is not crossed out is the secret number! 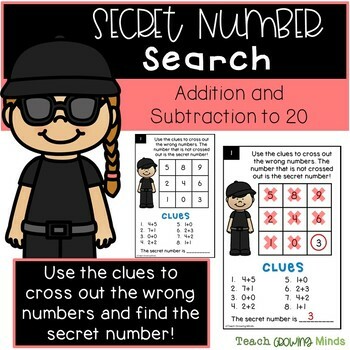 The problems include adding single digit numbers, adding 3 numbers, and subtracting. A fun way to practice math skills while building logic and problem solving skills. 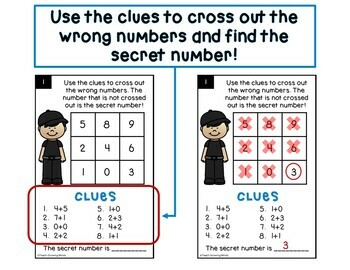 Could be used as math center or as an activity for early finishers. Print in color or blacks and white, laminate and students can cross out numbers directly on the cards and writ their correct answers on the recording worksheet. You could write the answers on the back to have self checking cards, and answer key is provided. Thank you for checking out my product! Please hit the green star to follow me and be the first to know about new products!